Designed to reduce first stage pressure of 5 to 20 PSIG down to burner pressure, normally 11” w.c. Ideal for medium commercial installations, multiple cylinder installations and normal domestic loads. Large vent helps prevent blockage and has ¾" F.NPT for vent piping. 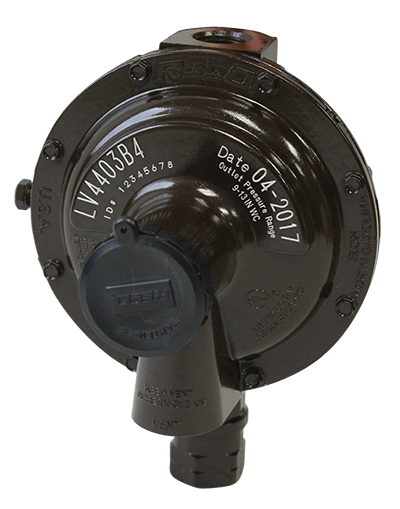 With 15 PSIG inlet pressure, regulator is designed to not pass more than 2 PSIG with the seat disc removed. Straight line valve closure reduces wear on seat disc. Built in pressure tap has plugged 1⁄8" F.NPT outlet. Plug can be removed with a 3⁄16" hex allen wrench.